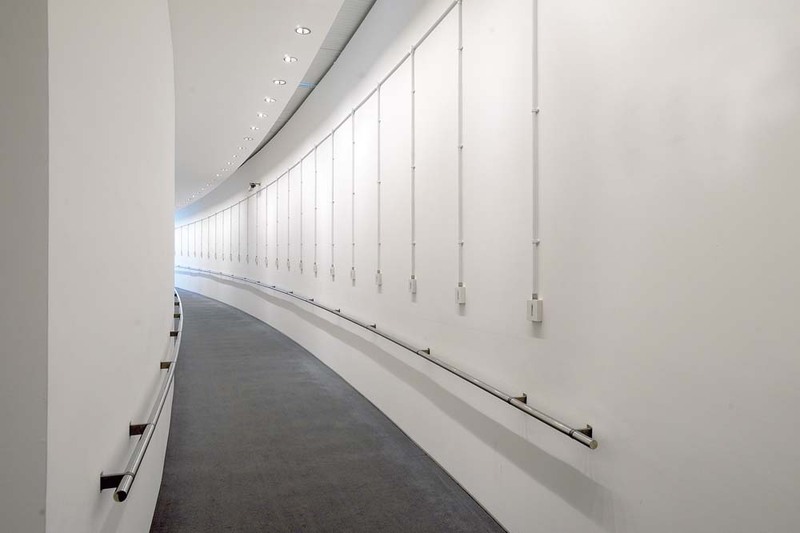 Extending areas of investigation instigated by the handrail/barrier forms (see Arbitrary Divisions), this body of studio enquiry continued to address ideas about repetitive spatial practices and embodied corporeality. 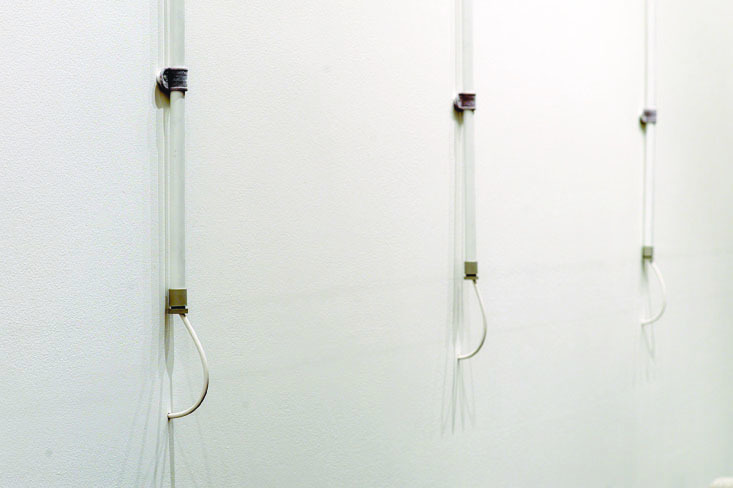 Ongoing concerns informing the developing practice included an interest in touch and the way that ubiquitous aspects of the built environment such as door handles and light switches mediate between the body and space, instigate unconscious routinely repeated patterns of behaviour and mark points of transition. The studio enquiry also found correspondence with earlier references to plain sewing in the way that these often overlooked objects of material culture have a quotidian utilitarian anonymity but nevertheless are crucial to the functioning of our everyday activities. Whereas the earlier multiple ‘bag’ forms and ‘handrails’ made an impact through their size, this new body of work offered the opportunity to investigate the potency of material from the perspective of a more intimate scale. 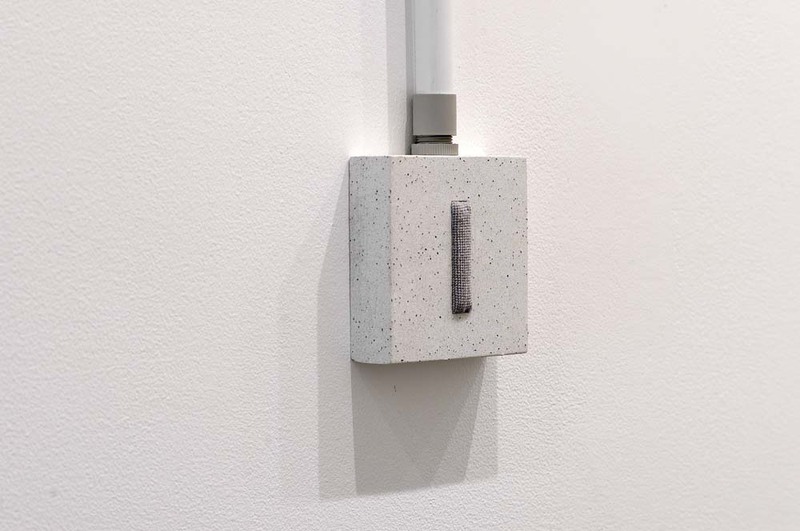 Focusing on small-scale gestures and localised touch between fingertips and surface, the concern was how more minimal interventions could still evoke an affective corporeal presence. The embodied corporeality investigated through this body of studio enquiry operates on several levels: through the audience’s physical engagement with the installation; by awakening internalised spatial practices and corporeal habits; and through the way that these repetitive corporeal habits are echoed in the repetitive process of the work’s making, particularly the intricately stitched canvas-work elements. As a counted thread technique, canvas work clearly references the time in its making. The slow accumulation of hand stitches and subsequent ‘drama’ of the work’s creation (the labour intensity of hours and hours of stitching) becomes concentrated into the small stitched panels as the temporal nature of the activity is collapsed into the spatial. In one sense the laborious activity becomes silenced and invisible but with the intention that through this concentration, the spatial is extended back into the temporal as the time of the works making becomes retrievable in the imagination of the viewer. Bristow, M. (2004) Material Trace - Marking Time and Defining Space. In: Through the surface: collaborating textile artists from Britain and Japan. Farnham: The Surrey Institute of Art and Design University College. Bristow, M. (2007) Delegate pack statement, Pushing Boundaries Symposium - a partnership between Craftspace, Staffordshire University and Designer Maker West Midlands, developed to accompany the ‘Made in the Middle’ national touring exhibition.